Can GHOST SHARK Scare Up Viewers for SyFy? Tonight sees the premiere of GHOST SHARK on (wait for it…) SyFy. Now, I’m not going out on a limb and predicting the same sort of inspired lunacy as SHARKNADO, but this flick looks like it has some potential. Take Cover! It’s a Sharknado! 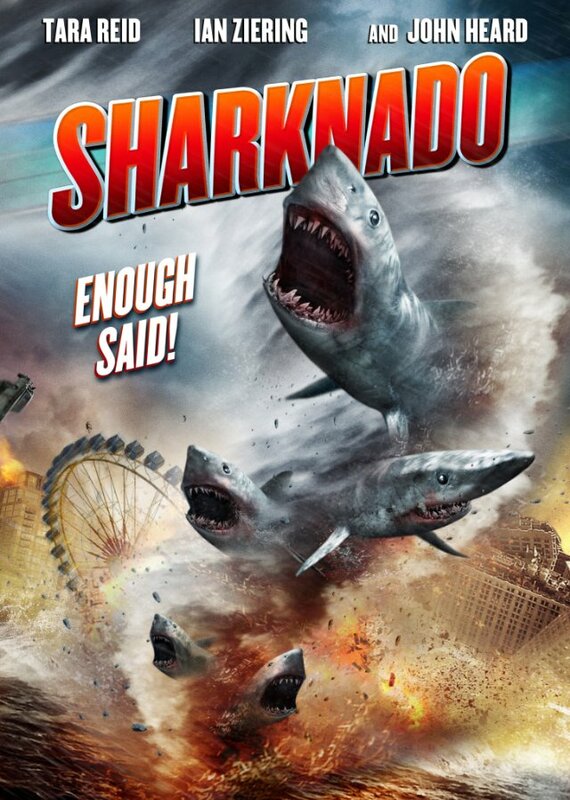 Don’t think; just enjoy the madcap awesomeness of this poster for SyFy’s Sharknado. Even if the title Sharknado doesn’t exactly roll trippingly off the tongue, it is nonetheless inspired. Sharknado strikes SyFy on July 11. It’s great to see new scenes with our old friends. The story fills in blanks left in the regular series; THE PLAN doesn’t so much fill in gaps as expand on what was hinted at happening offscreen. We saw things from the other side, including how Cavil (Dean Stockwell) controlled Sharon (Grace Park) — using a carving of an elephant that activated post-hypnotic suggestions — why Ellen Tigh (Kate Vernon) did not show up immediately, and exactly how the Shelly version of Six (Tricia Helfer) disappeared so completely after trying to discredit Baltar and his cylon-detecting machine. The Simons (Rick Worthy) were the least-developed model in the series, but here the 4s get major attention. Cavil spent the entirety of the series trying to get the cylons in the fleet to pick up the pieces.